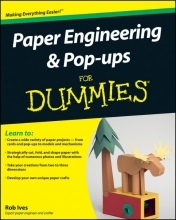 This fun, easy to follow guide is packed with a wide range of projects that use simple techniques and tools for creating paper projects that "pop" off the page. Step by step directions and diagrams show readers how to make eye catching cards, animated models, pop ups, and much more. Part I: Introducing the Magic of Paper Engineering. Chapter 1: Unfolding the Mystery of Paper Engineering. Chapter 2: Paper The Essential Ingredient. Chapter 3: Making Your Paper Engineering Workshop Work for You. Chapter 4: Putting Everything Together: Techniques and Safety Tips. Part II: Going Flat Out: Commencing with Creative Paper Crafts. Chapter 5: Whipping Up Cards and Flyers, from Classy to Crafty. Chapter 6: Making a Pop with Your Pop up. Chapter 7: On the Slide: Moving Along with Tabs and Wheels. Chapter 8: Mixing It Up! Pop ups, Pull Tabs, and Cross Fades, All in One. Part III: Paper Sculpture and Animation: Adding Some 3D Life to Paper. Chapter 9: Paper Sculpture: 3D Art from Paper or Card. Chapter 10: Lights, Cams, Action! Having Fun with Paper Animations. Chapter 11: Getting Past the Limitations of Paper in Your Paper Animations. Chapter 12: Using Mechanisms to Bring Models to Life. Part IV: Drafting Your Own Designs and Creations. Chapter 13: Developing Your Own Designs. Chapter 14: Using Technology to Design Your Own Projects. Chapter 15: Making Some Extra Moolah by Selling Your Paper Creations. Chapter 16: Ten Tips for Perfect Paper Projects. Chapter 17: Ten Ways to Develop Your Design Skills.